We had our first snow of the season today. Just a bit of snow–enough to put schools on a delay, but not enough to cause mayhem. I was hoping for snowmageddon, but no such luck. Still, it was a great day for homemade breakfast, baking these awesome whole wheat blondies and organizing the kitchen. I love days like that. 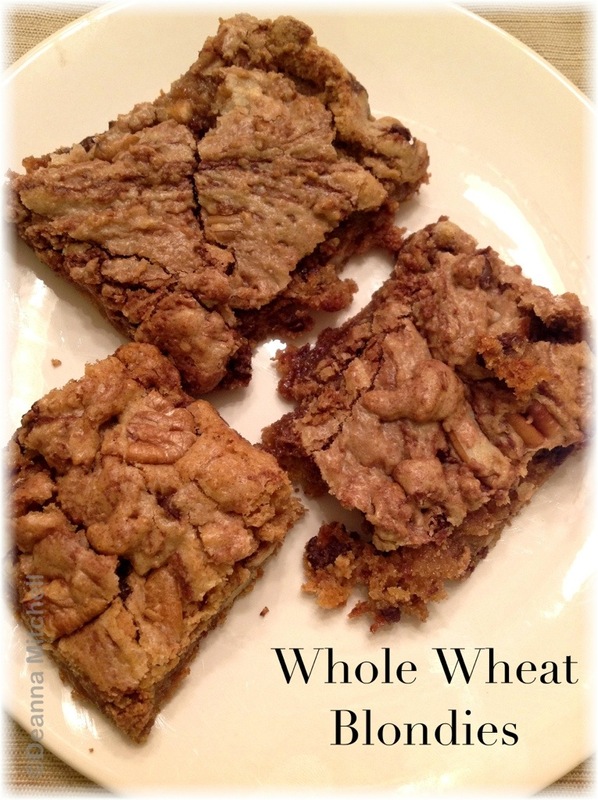 These blondies are rich and delicious and with whole wheat flour, they are also filling. We made them with local new crop pecans and chocolate chips. If you don’t like chocolate, just leave that out. Either way, they are amazing with Blue Bell butter pecan ice cream. The original recipe for these blondies comes from Lauren Chattman’s “Mom’s Big Book of Baking”. Here is our version! Preheat oven to 350 degrees. Line an 8″ square baking pan with foil. Combine flour, baking powder and salt in a mixing bowl. Set aside. In a saucepan, melt the butter over medium heat. Remove pan from heat. Stir in the brown sugar and combine well. Quickly add the egg and vanilla and stir well. Stir in flour mixture until just incorporated. Stir in nuts and chocolate. Batter will be thick. Pour batter into prepared pan. Bake for 30 minutes. When cool, grab foil and pull the entire pan of Blondies out and place on a cutting board. Cut into 9 generous squares. Ummmm… who doesn’t like chocolate? That’s bananas. I LOVE blondies. Never tried them with whole wheat flour. I’ll be making these. Yeah!!! Also– we got NO SNOW!! I was totally hoping for snowmageddon, too. Wow–I was thinking you probably had snow since you’re west of us. Stupid global warming. They are pretty yummy! Satisfying, too, so you don’t end up eating a lot!